Gold dipped Friday, breaking away from a three-day winning streak but still notching a weighty weekly advance of $50.50, or 2.9%. This week proved to be silver’s party, however, as prices soared 6.4% — a gain that triggered several U.S. Mint silver product suspensions. Platinum was not far behind the white metal, rising 5.0% and ahead of palladium’s 3.3% weekly increase. "We had a huge rally already in many commodities," Bloomberg quoted Jesper Dannesboe, an analyst at Societe Generale SA in London. "In the near term I think a correction could come, or at least a consolidation, and then you should maybe try to buy on those dips. We’re moderately bullish." In its settlement Friday, gold prices declined $9.90, or 0.6%, to $1,776.40 an ounce in the April futures contract on the Comex in New York. The close is gold’s best since November 11. Gold moved between an intraday low of $1,771.30 and a high of $1,784.40. Sizeable majorities in Kitco and Bloomberg surveys are forecasting higher gold prices next week just as they did for this week. "Most participants in the weekly Kitco News Gold Survey are expecting gold prices to rise next week, with $1,800 an ounce a possible upside target," reports Kitco News. "In the Kitco News Gold Survey, out of 32 participants, 24 responded this week. Of those 24 participants, 19 see prices up, while three see prices down, and two are neutral on prices… Many of the survey participants cite the heightened saber-rattling between Iran and the Western nations as their reason to see gold prices rise." In Bloomberg’s weekly gold survey, 17 of 23 participants expect higher prices next week, 5 are bearish and 1 is neutral. Gold is the third best performing precious metal this year, behind silver and platinum. Prices have rallied $209.60, or 13.4%, in 2012. In other New York precious metals futures, silver prices for March delivery settled at $35.338 an ounce, down 21.8 cents or 0.6%. Silver touched its lowest price of the day at $35.190 and its top price at $35.720. "Silver looks like it is rallying more with gold than on its own merit, in our view. This may leave it open for a pullback," said James Steel, chief commodity analyst at HSBC, according to Reuters. For the year, silver prices have surged $7.423, or 26.6%. In PGM metals, Platinum prices for April delivery fell $7.90, or 0.5%, to $1,715.10 an ounce, trading between $1,708.50 and $1,729.90, while palladium prices for March delivery declined $7.65, or 1.1%, to $710.75 an ounce, ranging from $708.50 to $720.00. Platinum has gained $310.20, or 22.1%, in 2012 while palladium has advanced $54.60, or 8.3%. 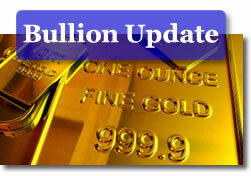 Weekly precious metals increases were 3.2% for gold, 6.2% for silver, 4.6% for platinum and 2.4% for palladium. A shortened holiday week coupled with two zero-day gains for U.S. Mint bullion coins was less than conducive for overall weekly sales. Still, bullion American Silver Eagles rose 415,000 this week, rebounding from the previous 125,000 which was the coin’s lowest weekly level of the year. Gold bullion was hit hardest as American Gold Eagle sales came in at a scant 1,000 for the week versus the prior 6,500. The following U.S. Mint bullion coin figures show the latest weekly, monthly and year-to-date sales. All bullion coin totals in the above tables are in the number of coins sold, not the amount of ounces. The latest five-ounce sales were provided by the U.S. Mint on Friday, January 27, 2012. The Mint does not publish daily sales figures for its five-ounce silver coins. Although, since the last released date is more than three weeks past, there likely has not been new sales to report.